You know that feeling, right? You go to the store and see the marinated vegetables sitting in the olive bar and think how awesome it would be to have some of those. You start remembering the antipasti you’ve had at that great little family run Italian restaurant. So you give in to temptation and buy a pint or a quart along with some olives and maybe a little prosciutto from the deli. Once at home, you assemble a beautiful plate of food and then wind up completely disappointed with your first bite of vegetable salad when it is too oily, isn’t tart enough and has no flavor. The solution to drab, tasteless grocery store offerings is to make your own marinated vegetables. This is a super easy recipe but does require a little time for prepping the vegetables and allowing them to cool to room temperature in the brine. Once made, however, the salad will keep in the refrigerator for up to 2 weeks. This also makes alot, and I do mean lots and lots of marinated veggies. It will easily serve 10-12 people as a side dish and makes a great addition to a picnic or to a pot-luck table. Feel free to use whatever vegetables you like and to leave out the one’s that you can’t stand. You can also cut the recipe in half to make a more reasonable amount for a small family gathering. Clean the mushrooms under a little running water and trim a small amount off the bottom of each stem. Leave the small mushrooms whole and cut the larger ones in half. Set up a steamer basket over medium heat. Steam the mushrooms for 7-10 minutes until tender. Set aside. To a 6- to 8-quart stockpot (do not use aluminum), add the red wine vinegar, water, kosher salt, oregano, bay leaves, garlic and olive oil. Bring to a rolling boil over high heat. Add the broccoli and cauliflower. Cook for 1 minute. 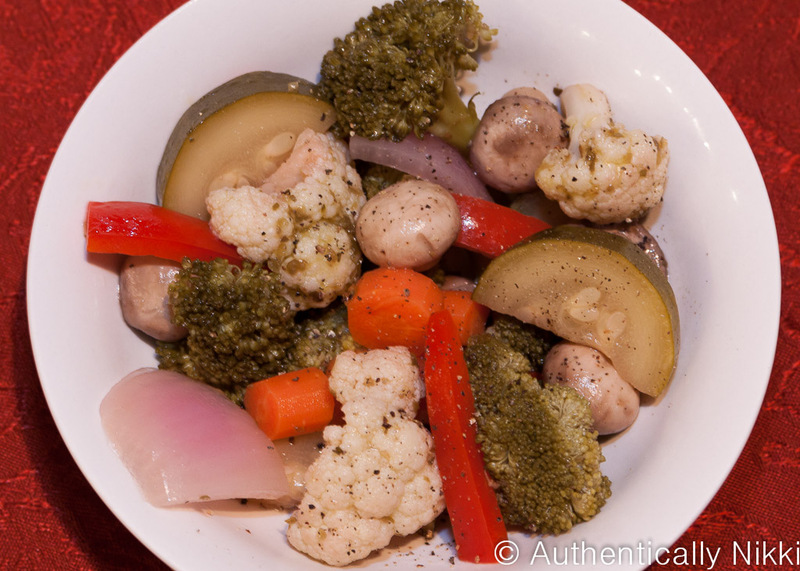 Turn off the heat and add the rest of the vegetables including the steamed mushrooms. Cover and let cool on the counter top or stove top until it reaches room temperature. Refrigerate the salad in the marinade for up to 2 weeks. Serve either cold or at room temperature. You can dress up the salad with a drizzle of extra virgin olive oil, some freshly ground black pepper and chopped flat-leaf parsley, if desired. This entry was posted in Food, Salads, Side Dishes and tagged antipasti, Italian, marinated, salad, vegetables by authenticallynikki. Bookmark the permalink.